The Villa Barton campus on the shores of Lake Geneva. IHEID's later logo at Villa Barton's main gate. Each of the Graduate Institute's five academic departments -- International Relations & Political Science; International History; International Law; International Economics; and Anthropology & Sociology of Development -- offers a disciplinary MA. It is a two-year program and students are expected to write a master's thesis. LL.M.は、2012年に新設されたプログラムである。 Students have the opportunity to discuss legal problems in tutorials, develop their professional skills in practical workshops and write an LL.M. paper on a topic within their specialty stream. Moreover, LL.M. participants undertake real legal work for a client as part of a law clinic. Furthermore, IHEID is home to the Swiss Chair of Human Rights, the Curt Gasteyger Chair in International Security and Conflict Studies, the André Hoffmann Chair in Environmental Economics, the Pictet Chair in Environmental International Law, the Pictet Chair in Finance and Development, the Yves Oltramare Chair on Politics and Religion, and the Swiss Chair of International Humanitarian Law. The Center on Conflict, Development and Peacekeeping is the Graduate Institute’s focal point for research in the areas of conflict analysis, peacebuilding, and the complex relationships between security and development. The Center for International Environmental Studies was established in 2010 for the purpose of developing political, legal and economic discourse on problems related to the global environment. It is dedicated to the better understanding of the social, economic and political facets of global problems related to the environment. The Center for Trade and Economic Integration brings together the research activities of eminent professors of economics, law and political science in the area of trade, economic integration and globalization. The Centre provides a forum for discussion and dialogue between the global research community, including the Institute's student body and research centres in the developing world, and the international business community, as well as international organisations and NGOs. The Center for Finance and Development's research deals with finance and development at three levels: international finance, and development finance in particular, including the role played by the international financial institutions such as the IMF and the World Bank; financial development, including banking and financial sector development in emerging and developing countries, both from contemporary and historical perspectives; microeconomics of finance and development. The Programme for the Study of International Governance provides a forum for scholars of governance and international organisations to interact with practitioners from the policy world in order to analyse global governance arrangements across a variety of issues. The Global Health Program's activities focus on two pillars, namely global health governance and global health diplomacy. The Global Migration Centre focus on the transnational dimensions of migration and its interdisciplinary orientation. By doing so the GMC seeks to fully grasp the complexities of mobility in a globalized world. To this end, it combines inputs from lawyers, political scientists, economists, historians, anthropologists and sociologists. The Programme on Gender and Global Change produces cutting-edge research on the workings of gender in development and international relations and serves as a channel for the dissemination of such knowledge in both the anglophone and the francophone worlds. The Small Arms Survey is an independent research project that serves as the principal international source of public information on all aspects of small arms and armed violence and as a resource for governments, policy-makers, researchers, and activists. APSIA - Association of Professional Schools of International Affairs: The world’s main academic institutions specialising in international relations and international public policy are represented among APSIA’s thirty-odd members. European University Association: Represents and supports more than 850 institutions of higher education in 46 countries, providing them with a forum for cooperation and exchange of information on higher education and research policies. Europaeum: Created at the initiative of the University of Oxford, the Europaeum is composed of ten leading European institutions of higher education and research. European Consortium for Political Research: The ECPR is an independent scholarly association that supports the training, research and cross-national cooperation of many thousands of academics and graduate students specialising in political science and all its sub-disciplines. European Association of Development Research and Training Institutes: The EADI is the largest existing network of research and training institutes active in the field of development studies. It publishes the European Journal of Development Research (EJDR) as well as monographs (Amsterdam University Press). It also organises a General Conference every three years. Agence Universitaire de la Francophonie: The AUF supports the build-up a French-language research area between French-speaking universities. The Institute is one of 536 members belonging to the AUF and takes part in its exchange programmes in the fields of teaching and research. Swiss University Conference: The SUC is a governmental organization tasked with accrediting officially recognized Swiss universities. The school maintains exchange programs with institutions worldwide, including Georgetown Law School, Harvard Law School, Michigan Law School, UCLA School of Law, Boston University School of Law, Yale University, the Elliott School of International Affairs at George Washington University, the Fletcher School of Law and Diplomacy at Tufts University, American University, School of International Service in Washington D.C., Sciences Po Paris - Institut d'Études Politiques de Paris, the Hertie School of Governance in Berlin, the Graduate School of International Studies at Seoul National University, the Lee Kuan Yew School of Public Policy at the National University of Singapore, the Graduate School of Asia-Pacific Studies at Waseda University, University of Hong Kong, Tsinghua University, Fudan University, Peking University, KIMEP University, Gadjah Mada University, the School of International Studies at Jawaharlal Nehru University, University of Malaya, the American University in Cairo, Pontifical Catholic University of Rio de Janeiro, Pontifical Catholic University of Peru, El Colegio de México, the University of Ghana, Cheikh Anta Diop University, Stellenbosch University, as well as the University of St. Gallen and ETH Zürich in Switzerland. Published by Oxford University Press and based at the Graduate Institute, the Refugee Survey Quarterly is a peer-reviewed journal focusing on the challenges of forced migration from multidisciplinary and policy-oriented perspectives. Established by the Graduate Institute and the University of Geneva in 2010, the JIDS is dedicated to international law with commercial, economic and financial implications. It is published by Oxford University Press. A peer-reviewed e-journal that promotes cutting-edge research and policy debates on global development. The European Journal of Development Research is a co-publication of the Graduate Institute and the European Association of Development Research and Training Institutes with a multi-disciplinary focus. Relations Internationales publishes research on international relations history ranging from the end of the 19th century to recent history. A pluralist platform for advancing academic knowledge and debate in the field of political science. IHEID is constituted as a Swiss private law foundation, Fondation pour les hautes études internationales et du développement, sharing a convention with the University of Geneva. This is a particular organizational form, because IHEID is constituted as a foundation of private law fulfilling a public purpose. In addition, the political responsibility for the Institute shared between the Swiss Confederation and the Canton of Geneva. 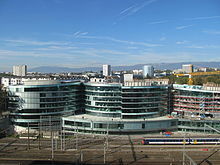 Usually in Switzerland, it is the responsibility of the Cantons to run public universities, except for the Federal Institutes of Technology (ETHZ and EPFL). IHEID is therefore something like a hybrid institution, in-between the two standard categories. The Foundation Board is the administrative body of the Institute. It assembles academics, politicians, people of public live and practitioners. Jacques Forster (Vice President of the ICRC) is President of the Board. The vice-president is Isabelle Werenfels (senior researcher at the German Institute for International and Security Affairs). The Board includes among others: Carlos Lopes, currently UN Under Secretary General and Executive Secretary of the Economic Commission for Africa, Julia Marton-Lefèvre (Director of the International Union for Conservation of Nature), Joëlle Kuntz (journalist), and Yves Mény (president emeritus of the European University Institute in Florence). The Institute is headed by Philippe Burrin and his deputy Elisabeth Prügl. Delia Albert — former Secretary of Foreign Affairs of the Philippines. Youssouf Bakayoko (Certificate '71) — Foreign Minister of Côte d'Ivoire and Ambassador. David Bakradze ('98) — Chairman of the Georgian Parliament and former Foreign Affairs Minister. Sibusiso Bengu (PhD '74) — former Minister of Education of South Africa. István Bibó (PhD '35) — former Minister of State of Hungary. Patricia Espinosa (DEA '87) — Secretary of Foreign Affairs of Mexico. Abul Fateh (Fellow '62-'63) — first Foreign Minister of Bangladesh. He Yafei (DEA '87) — Assistant Foreign Minister of China. Manouchehr Ganji (PhD '60) — Iranian human rights activist and former Education Minister. Parker T. Hart (Certificate '36) — Former U.S. Assistant Secretary of State for Near Eastern and South Asian Affairs. Annemarie Huber-Hotz ('75) — Federal Chancellor of Switzerland between 2000 and 2007. Sandra Kalniete ('95) — Minister of Foreign Affairs of Latvia between 2002 and 2004, current member of the European Parliament. Paul Joseph James Martin — Foreign Minister of Canada between 1963 and 1968. Omer Tshiunza Mbiye (DEA '67) — former Minister of Economy of the Democratic Republic of Congo. Robert McFarlane (Licence) — United States National Security Advisor between 1983 and 1985. Ram Niwas Mirdha — former Cabinet Minister in India. Kamel Morjane — former Defence Minister and Foreign Minister of Tunisia. Saïd Ben Mustapha — Foreign Minister of Tunisia between 1997–1999. Kristiina Ojuland ('92) — former Foreign Minister of Estonia and current member of the European Parliament. Andrzej Olechowski — former Minister of Finance and Minister of Foreign Affairs of Poland. Marco Piccinini — Minister of Finance and Economy of Monaco. Francisco Rivadeneira ('95) — Minister of Foreign Trade and Economic Integration of Ecuador. Haroldo Rodas (DEA) — Foreign Minister of Guatemala. André Simonazzi (Licence '92) — Vice Chancellor of the Swiss Federal Council. Albert Tevoedjre — former Minister of Information of Benin. Ton That Thien (PhD '63) — former Cabinet Minister and public intellectual in Vietnam. Omar Touray (DEA '92, PhD '95) — former Secretary of Foreign Affairs of Gambia. Rep. Michael D. Barnes (DEA '66) — US Congressman from 1979 to 1987. Jacques-Simon Eggly — Swiss member of Parliament. Mauricio Mulder (DEA '85) — member of Peruvian Congress. Jacques Myard (PhD) — member of the National Assembly of France. Hans-Gert Pöttering (PhD) — former President of the European Parliament, 2007-9. Meta Ramsay, Baroness Ramsay of Cartvale — former British intelligence officer and member of House of Lords. Emrys Roberts — President of the British Liberal Party between 1963-1964. Zalman Shoval (DEA) — former Knesset member and Israeli Ambassador to the US. Alexandra Thein — German politician and member of the European Parliament. Shelby Cullom Davis (PhD '34) — US Ambassador to Switzerland between 1969 and 1975 and philanthropist. Elyes Ghariani — Tunisian Ambassador to Germany. Claude Heller (DEA) — Ambassador of Mexico to the United Nations. Tamara Kunanayakam (DEA '82) — Ambassador of Sri Lanka to the United Nations Office in Geneva. A.H.M. Moniruzzaman (Certificate '89) — Ambassador of Bangladesh to Belgium, Switzerland, and Luxembourg. Robert G. Neumann ('37) — American Ambassador and politician. Michael Reiterer ('85) — Ambassador of the European Commission to Switzerland. Luis Solari Tudela — Ambassador of Peru to the United Kingdom. Mohamed Ibrahim Shaker (PhD '75) — Egyptian Ambassador. Christian Wenaweser — Ambassador of Liechtenstein to the United Nations. Giorgio Malinverni (PhD '74) — Judge at the European Court of Human Rights. Fatsah Ouguergouz (PhD '91) — judge at the African Court on Human and Peoples' Rights. Christos Rozakis (Visiting scholar '85-'86) — first vice-President of the European Court of Human Rights. Max Sørensen (PhD '46) — former Judge at the European Court of Justice (1973 -1979) and the European Court of Human Rights (1980-1981). Nina Vajić (DEA) — Judge at the European Court of Human Rights. Abdulqawi Yusuf (PhD '80) — Judge at the International Court of Justice. Jakob Kellenberger: alumnus, former ICRC President. Hédi Annabi — former Special Representative of the United Nations Secretary-General for Haiti. Anthony Banbury — United Nations Assistant Secretary-General for Field Support. Marcel André Boisard (PhD) — Under-Secretary General to the United Nations and former Executive Director of United Nations Institute for Training and Research. Arthur E. Dewey — former Assistant UN Secretary-General. Kamil Idris (PhD '64) — director-general of the World Intellectual Property Organization (WIPO) between 1997 and 2008. C. Wilfred Jenks — Director-general of the International Labor Organization (1970–1973). Jakob Kellenberger ('74-'75) — President of the ICRC. Carlos Lopes (DEA) — UN Under Secretary General and Executive Secretary of the Economic Commission for Africa. Jonathan Lucas (PhD '98) — Head of the International Narcotics Control Board. Jacques Moreillon (PhD '71) — former Director General of the ICRC. Mervat Tallawy — Egyptian politician, former UN under-secretary and executive secretary of ESCWA. Sérgio Vieira de Mello— former United Nations High Commissioner for Human Rights. Shara L. Aranoff (Fulbright Scholar '84-'85) — Chairman of the U.S. International Trade Commission. Tennent H. Bagley (PhD '50) -- Deputy Chief of the CIA's Soviet Bloc Division during the 1960s and author. Jennifer Blanke (PhD '05) — Chief Economist, World Economic Forum. Robert-Jan Smits — Director General for Research at the European Commission. Edward Kossoy (PhD '75) — Polish lawyer and activist for victims of Nazism. Hernando de Soto — Peruvian economist and President of the Institute for Liberty and Democracy (ILD). Laure Waridel CM — Canadian social activist and writer. Samuel A. Worthington (Fulbright '85) — CEO of InterAction. Georges Abi-Saab (PhD) — preeminent Egyptian international law specialist. Antony Alcock (PhD '68) — historian and Ulster unionist politician. Andrew W. Cordier ('30-'31) — former President of Columbia University (1968–70). Victoria Curzon-Price (PhD) — Economist and former director of the Mont Pelerin Society. Wolfgang F. Danspeckgruber (PhD '94) — Austrian political scientist at Princeton University, expert on self-determination. Marwa Daoudy (PhD) — political scientist specializing in the Middle East. Paul Demeny — Pioneered the concept of Demeny voting. Paul Dembinski — scholar specialized on finance and ethics. Rüdiger Dornbusch — MIT international economist. Osita C. Eze (PhD '75) — former director-general of the Nigerian Institute of International Affairs. Marcus Fleming — Scottish economist, former deputy director of the research department of the International Monetary Fund. Saul Friedländer (PhD '63) — Israeli historian of Germany and Jewish history at UCLA, awarded the 2008 Pulitzer Prize for General Non-Fiction. Piero Gleijeses (PhD '72) — Italian historian of U.S. foreign relations at the School of Advanced International Studies (SAIS), Johns Hopkins. Thierry Hentsch (PhD '67) — Swiss-Canadian political philosopher. John H. Herz ('38) — American scholar of international relations and law. Shireen Hunter (PhD '83) — Scholar on Iran. Robert Kolb (PhD '98) — International law professor. William Lazonick (PhD '75) — Business historian awarded the 2010 Schumpeter Prize. Boris Mouravieff (PhD '51) — Russian historian. ハンス・モーゲンソウ (post-graduate work '32) — 国際関係論を代表する理論家. André Reszler (Licence '58, PhD '66) — History of ideas scholar. Philippe C. Schmitter (Licence '61) — Emeritus Professor of the Department of Political and Social Sciences at the European University Institute. Pierre de Senarclens (PhD '73) — International relations theorist. Hsueh Shou-sheng (Licence, PhD) — Vice-Chancellor of Nanyang University in Singapore between 1972-75 and founding rector of University of Macau. Lyal S. Sunga (PhD '91) — ex-OHCHR official, international law and human rights specialist. J. Ann Tickner ('75-'76) — Feminist international relations theorist. Emanuel Treu — Dean of the Diplomatic Academy of Vienna (1975–1976) and Austrian ambassador to the United Nations. Peter Uvin (PhD '91) — Provost at Amherst College. Thomas G. Weiss — Scholar of international relations recognized as an authority on the United Nations system. Rick Gilmore (PhD '71) — President/CEO of the GIC Group and Council on Foreign Relations scholar. Philipp Hildebrand (DEA '90) — Vice President of BlackRock and former President of the Swiss National Bank. Léon Lambert — Prominent Belgian banker. Lynn Forester de Rothschild (Fellow '78-'79) — CEO of E.L. Rothschild. Frank Melloul (Licence '99) — CEO of i24news. Brad Smith (DEA '84) — Senior Vice President and General Counsel, Microsoft Corporation. G. Richard Thoman — American businessman who was President and CEO of Xerox Corporation. Robert Albert Bauer ('31) — anti-Nazi radio broadcaster with Voice of America. Carlos Fuentes ('50) — Acclaimed Mexican novelist and essayist. Beat Kappeler (PhD '70) — Swiss journalist. Esther Mamarbachi (DEA '92) — Swiss broadcast journalist. Jean-Pierre Péroncel-Hugoz (PhD '74) — French journalist and essayist. Nicolas Rossier ('95) — American filmmaker and reporter. Pierre Ruetschi (Licence '83) — Swiss journalist. Jon Woronoff (Licence '65) — American writer and East Asian specialist. Duarte Pio — Portuguese Duke of Braganza and claimant to the throne of Portugal. Jack Fahy — US government official and suspected spy during WWII. Henri, Grand Duke of Luxembourg. Kathryn Wasserman Davis — American philanthropist. Olivier Long — Swiss international law specialist and former director-general of the GATT (1968–80). Patrick Low — Chief Economist at the World Trade Organisation. Ludwig von Mises — Prominent Austrian school economist, philosopher, and classical liberal. Robert Mundell — Canadian international economist and recipient of the 1999 Nobel Memorial Prize in Economics. Gunnar Myrdal — Swedish economist and co-recipient of the 1974 Nobel Memorial Prize in Economics. William Rappard — economic historian, Director of the League of Nations Mandate Section (1920-1925), and Swiss delegate to the ILO (1945-1956). Wilhelm Röpke — International economics and spiritual father of the German social market economy. Jacob Viner — Canadian international economics and early member of the Chicago School of Economics. Jean Ziegler — Swiss Sociologist, author and public intellectual. Richard Baldwin — Professor of International Economics. Thomas J. Biersteker — Curt Gasteyger Professor of International Security, Council on Foreign Relations scholar. Andrew Clapham — Professor of International Law, former Representative of Amnesty International at the United Nations, and former Adviser on International Humanitarian Law to the Special Representative of the UN Secretary-General in Iraq. Pierre-Marie Dupuy — Professor of International Law, whose Droit international public is "one of the best known French international law textbooks" according to the European Society of International Law. Faisal Devji — Yves Oltramar Chair of Religion and Politics, noted historian of Islam. Keith Krause — Professor of International Relations, director of the Small Arms Survey. Jussi Hanhimäki — Professor of International History, recipient of the 2002 Bernath Prize for his book The Flawed Architect: Henry Kissinger and American Foreign Policy. Ilona Kickbusch — Adjunct Professor, leading thinker in the fields of health promotion and global health. Giacomo Luciani — Leading scholar on the geopolitics of energy. Joost Pauwelyn — Professor of International Law, famous scholar in WTO law and public international law. Marcelo Kohen — Professor of International Law, scholar with experience practicing before the International Court of Justice. Xiang Lanxin — Professor of International History and Politics, regular columnist in the South China Morning Post. Nicolas Michel — Professor of International Law, former Under-Secretary-General for Legal Affairs and United Nations Legal Counsel. Mohamed Mahmoud Ould Mohamedou — Visiting professor of International History, former Foreign Minister of Mauritania and acclaimed Al Qaeda specialist. Ugo Panizza — Pictet Professor of Development and Finance. Martin Riesebrodt — Yves Oltramar Professor of Religion and Politics. Timothy Swanson — André Hoffmann Professor of Environmental Economics. Charles Wyplosz — Professor of International Economics, regular columnist in the Financial Times, Le Monde, Libération, Le Figaro, Finanz und Wirtschaft, and Handelsblatt. ^ a b c Peter, Ania (1938). “William E. Rappard and the League of Nations: A Swiss contribution to international organization”. The League of Nations in Retrospect: Proceedings of the Symposium. Walter de Gruyter. pp. 221-222. ISBN 3-11-008733-2. The Graduate Institute of International Studies Geneva: 75 years of service towards peace through learning and research in the field of international relations, The Graduate Institute, 2002.